We've long thought that we get more rain in Port Levy than than they do at Lyttelton and now that we have a PWS at Port Levy, we can find out for sure by comparing measurements. There are four nearby AWSs, as shown in the map to the left, where the AWSs are marked with a red blob. The AWSs have data extending back many decades, whereas we have only at short record at the Port Levy PWS (25-Jun-2010 onwards), so we will compare rainfall events rather than the usual comparison of monthly totals. There are five nearby PWSs, as shown on the map to the left. 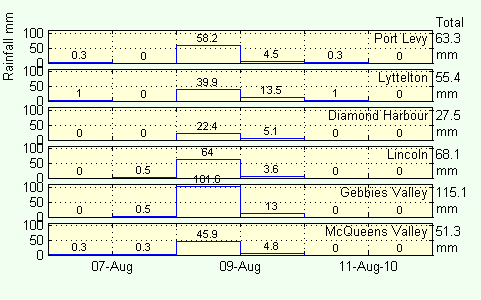 These PWSs are maintained by amateurs who kindly post their data to the Weather Underground site. During August 2010, there were two significant rainfall events from the southeast which resulted in the monthly mean rainfall at most sites being substantially more than the long-term median for August. 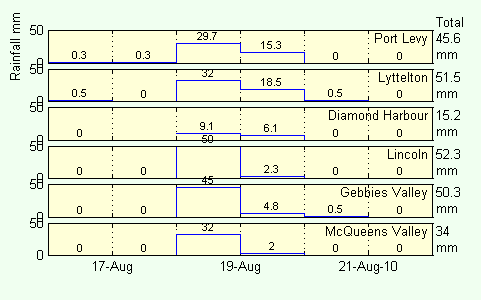 In the following, we compare the rainfall during these two events for the Lyttelton and Le Bons Bay AWSs and all the PWSs. Thus, if it rains between midnight and 0900, that rain will be attributed to the previous day in the AWSs, but to the present day in the PWS. 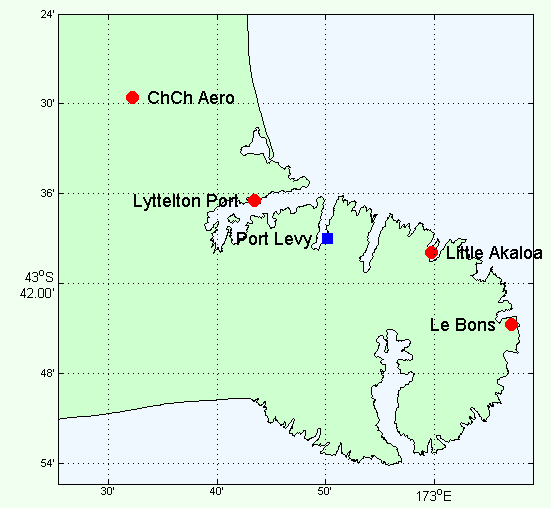 In this event, the rainfall at Port Levy was much larger than that at Lyttelton, but about the same as the rainfall at Le Bons Bay. For the PWSs, the Port Levy rainfall was about the average of all the other PWSs. 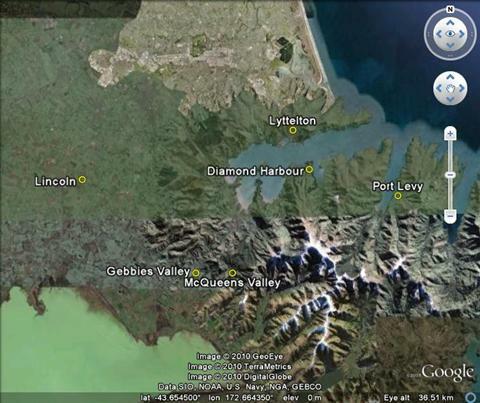 The Diamond Harbour PWS was lower than the rest and similar to the Lyttelton AWS. In fact these two gauges have similar aspects, facing east to the harbour entrance, albeit on either side of the harbour. The Lyttelton PWS, which is up behind Lyttelton, had much more rainfall than either of these. The rainfall at the PWSs was about the same, except for Diamond Harbour, which was much less. The position of the raingauge is crucial — e.g., is it sitting under a tree? The design of the collecting dish of the raingauge is important — does rain splash out? The storm direction is important — at Port Levy, we get more rain in southerlies than in easterlies. 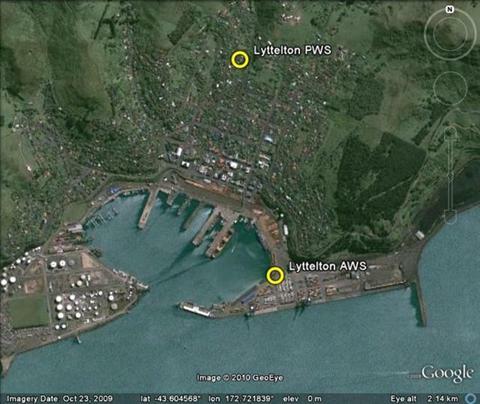 In the two southeasterly storms in August 2010, the rainfall at the Lyttelton PWS was substantially greater than the rainfall at the AWS. Their locations are shown to the left. Evidently, the location of the AWS on Z-Berth means that it is more sheltered from storms like these.